It’s hard not to notice the modern and casual Vietnamese eatery 1941. With an inviting and unintimidating atmosphere, it can sit only 30 people and much of the time that means there’s a crowd waiting outside. While visiting during peak hours can be hard work, we were lucky enough to get a table immediately. The menu is simple and straightforward. It offers noodle soups, cold vermicelli, rice meals and side dishes. Though deep-fried buttered chicken wings and the Vietnamese version of fried Cambodian rice noodle (both reasonably priced at $38) looked enticing, we decided to stick with the classics. 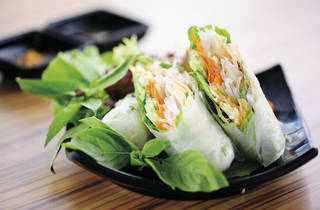 For starters, the freshly made rice rolls ($36) struck a good opening note. 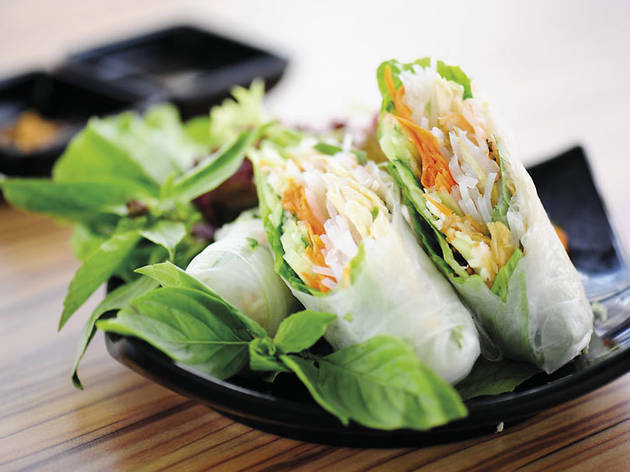 They were filled with vermicelli noodles, julienned cucumbers and carrots, chicken slices, small shrimps and fresh basil leaves that tasted refreshingly appetising. When dipped in the Chinese hoisin sauce with crushed peanuts to add a little flavour, they give your taste buds a good kick. The mark of a classy Vietnamese restaurant is the quality of its pho. At 1941, this normally soulful dish lacked a beefy note. But, despite the lack of this distinctive taste and any garnish, the raw beef and thin rice noodles still appealed to hungry stomachs. The same went for the lemongrass pork chop, which was served with a huge serving of rice ($36). Topped with dried garlic bits and chopped spring onions, the fragrant meat slices were tenderly cooked except for some parts which were disappointingly sinewy and tough. Despite the poor English of the waiting staff and the so-so food, 1941 is a decent shout for a quick fix of relatively inexpensive Vietnamese fare. Shop 2, 58-62 Caine Rd, Mid-Levels, 3483 3445. Daily noon-4pm & 6pm-9.30pm. Meal for two: around $150.